Flat, grey, lumpy. – Dirty wet dog , boats and sailing. Well that didn’t go to plan : the continuation of the UK voyage that is ! I’ll give you the short version first, those who particularly like long complicated excuses involving contrary winds and tides can stick around for the messy details. The short version is that rather being alongside the pontoon at Weymouth after an overnight passage…..i am back ‘home’ at Calstock boatyard and emptying the boat out. Calstock boatyard at 0 tide-thirty this morning. Last night (as i write) i picked up a mooring off Calstock boatyard after a 3 day trip back from Torquay where i left the boat in a blizzard after an ‘interesting’ day in Lyme bay. Four days ago i left home ridiculously early and got the first train out of dodge and 2 changes later was back in Torquay. One quick taxi ride and 10 minutes later i was aboard and throwing the lines off ready to motor across Torbay to get ready for either the night passage or a trip around to Dartmouth. My main weather problem at that point was still 8 hours or so of a threatened 45+ mph of wind from the south that night. Crossing Lyme bay in those conditions would have been foolhardy as i would have quite literally nowhere to run and nowhere to hide…..just imagine being hove-to in 40 knots of wind with either chesil beach or Portland race right behind me ! Torbay on thursday (first day of voyage) was flatter than a flat thing so i went for an explore of a little cove just near Brixham harbour which we missed during our cruise last year. That cove , it seems to have 2 different names will make a fine anchorage for us one day. What happened next was completely unexpected in that the wind came in light as a northerly so i made the choice to run down to Berry head and nip around to Dartmouth for the night just in case the southerly gale actually happened (spoiler alert…..it did). Off Dartmouth i met the first boats that i’ve seen out sailing this year, turns out they were sail training yachts from Dartmouth naval college and doing everything really, really, really slowly. Dartmouth, morning after the night before. WABI”’ doesn’t have an anenometer so i can’t tell you how hard it actually did blow but even tucked well away up the river on a big-boat mooring it was a bit ‘rock-n-roll’ and clearly blowing hard overnight. When i poked my head out of the hatch at 0500 there was still a bit of wind but by 0600 almost nothing as you can see by the almost flat calm off the town. There was some swell outside and the sea was a bit loppy as the new wind had kicked-in from the west but by then i had essentially missed my time and tidal slot for the passage east so i motor-sailed fast down to Start point and aimed for Salcombe instead. Entering Salcombe was entertaining as there was a southerly swell and the remnant of a near-neap ebb running over the bar. The bar itself was breaking and i was a bit busy for a while making sure i kept in deep water. For those that don’t know Salcombe it’s bar breaks heavily when a southerly gale blows against a spring ebb. Many years back a full-race Dehler DB1 called ‘Luv’ pitch-poled on the bar. If i remember this correctly the RORC magazine ‘Seahorse’ carried the leader “Head over heels in Luv” ! DB1….reckoned to be a good upwind boat ! Salcombe has quite a nice day anchorage inside the bar which was fine at low water soon after i got there but started to get uncomfortable by half-flood so i moved further up the river and picked up a mooring. I was still expecting a moderate westerly the next day which isn’t too bad as Plymouth is slightly north-west and any amount of south in the wind turns it into a close reach. What wind did kick in though was most definitely an easterly…and brisk so i ‘phoned home’ for a weather forecast. Turns out that the latest forecast was for a brisk easterly going nor-east and then north by late afternoon the next day. The best choice for the passage west to get through the narrows and up into the Tamar seemed to be yet another dawn start. Now : an easterly leaving Salcombe can have a bad reputation as waves can bounce (refract) off the cliffs of Starhole bay and true to form it was pretty horrible there and for about the first hour afterwards…..a firm easterly kicking up a big confused sea over i think still some amount of southerly swell. The first hour was hard work , grey cold, very low visibility until Bigbury bay openned out and the waves started to open out again. Another hour and i let Adolf the autohelm take over. It was a brutally cold passage with surf grumbling and growling on the cliffs under my lee. I may have got some film footage but most likely it’s just grey on grey. Running down to Berry head with the autohelm steering for the first time. Next Liberty offshore, Liberty ocean. Interesting trip How did Adolf go ? 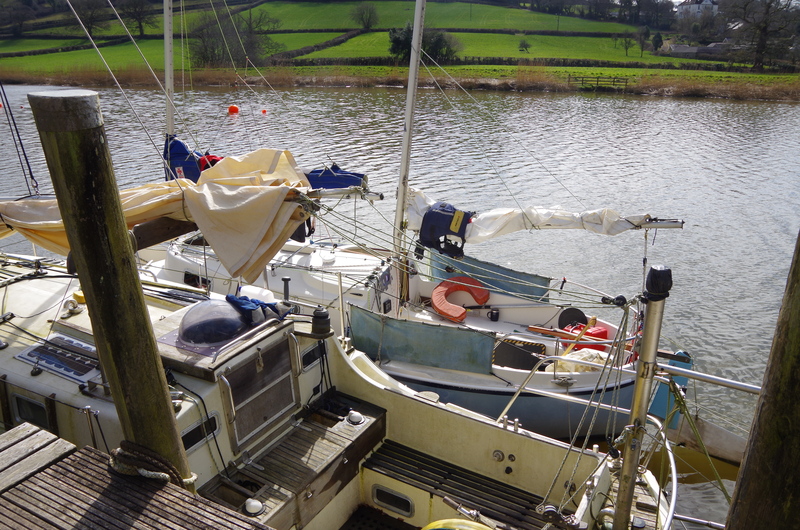 So plan B, trailer for the boat then you can avoid the delivery trips and just have the problem of where to put the trailer when out sailing ….